Evidence based policing: a debate of sorts. This is quite a hard blog to write as the subject matter is quite complicated. Evidence based policing isn’t simple, as nothing is with regards to human behaviour. The ‘based’ bit in the title is also a little dangerous, as it assumes that we may pick up evidence from elsewhere, drop it in without a care in the world, and expect it to work in policing. My tutors up at Canterbury would argue heavily for the word ‘informed’ to replace it, as that still takes into account context, experience etc. Policing has always been seen as taking its roots in a craft, and some of that will inevitably remain solid. Formulaic approaches won’t always work, and discretion will have its rightful place in the policing milieu. In the past we have had a profession where the craft ruled the roost. Practitioners often designed bottom up solutions, or were given top down initiatives. These were not shared often, and many ‘That wouldn’t work here’ comments were made with abandon. The NPIA were established to offer some standardisation across training and policy areas, but the relationship was strange, and they didn’t fare very well. No one was quite sure how it worked (from a practitioner perspective) and forces seemed to go off on their own regularly with new ideas and programs. Evidence bases were just absent, and often HMIC, the Home Office, or force entrepreneurship decided on programs of work. These were often conducted by favoured consultancies, such as the Quest intitiative. 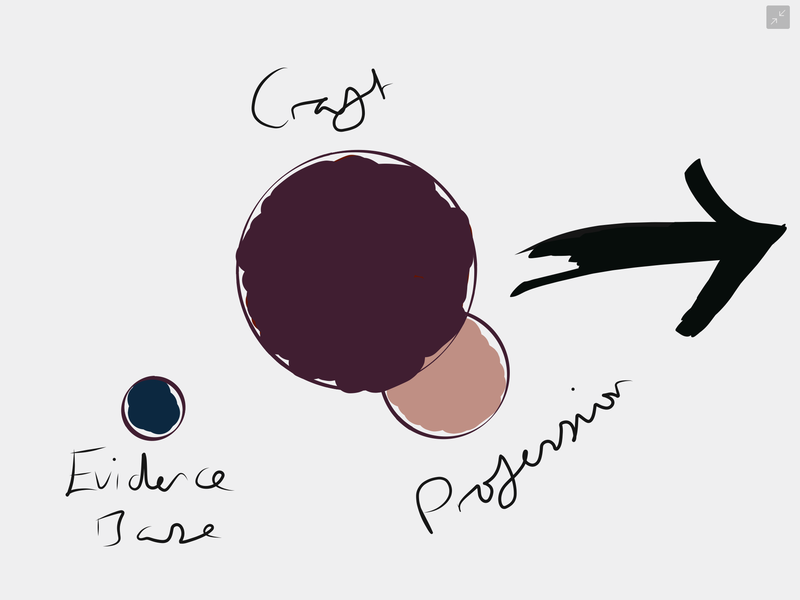 I am well aware that this is a simple model, but I think that you are hopefully seeing what is happening via my crap drawings. Now there’s a feeling around the imposition of EBP that is really negative, but it is so justifiable that it has to be explained. EBP isn’t a fad brought in by a group of consultants, nor is it purely an academic practice. Cops on the deck are involved in EBP and making trailblazing headway exploring the relationship between crime and our activity. This is then used by the force doing the work, shared locally, and good practice is then picked up via the College (CoP in the diagram) and shared nationally. This makes sense to me. I understand where it is going and establishing a working body of knowledge is a good idea in my humble opinion. So… The debate. It makes sense that people see EBP in the light of the last twenty years. It looks like a fad, it looks like another Quest, or another Lean or another… It isn’t a fad. (To be fair some fads are rooted in good evidence and should stick around.) It’s more of a way of thinking rather than a particular method of working. Decisions to change things need to now be justified with evidence, and this can usually take two forms, although they are conflated all the time. Evidence of the problem – not necessarily evidence of the solution. Evidence that a solution works/doesn’t work and is/isn’t transferable. There may be more, but these seem to be the most prevalent. Number 2 is when we know something works because we have tested it. It gets tested properly in many different places, and when we know it works it goes into the body of national work and we know we can draw on it when we need to. We mustn’t forget that EBP is not all about crime. People will talk about it incessantly, but do you know what, we are missing a huge trick if we take that stance. The work around wellbeing, recruitment, selection, promotion, and a whole host of other functions is already out there. There’s lots of evidence around employee motivation that we could learn a lot from, and if we take it into account it influences what leadership looks like (see the Leadership Review stuff). If supervision look after our staff and treat them like adults, they work harder and enjoy being at work far more. Complete no-brainer in my opinion. B) whilst we concentrate on ‘what works’, we forget about the people making it work. In other words, does ‘what works’ have a load of unseen cultural issues that may be far more painful than the result. I look at hotspot policing as a great example of this. Enforce it in a draconian fashion and the work becomes mind numbing. It reinforces process led policing, removes human skill and experience, and leads to auditing and compliance. Now that doesn’t sound like fun at all, is there a pain/pleasure debate to be had here? Absolutely. In this instance, making fewer victims in the short term, may lead to major retention and motivation issues, and therefore more victims in the future. I really hope that this helps to paint the picture of the landscape a little bit better. Please drop me any feedback in the comments or on Twitter. Please remember that anything critical in here is because I’m trying to add to the debate 😀 The more we approach this stuff without rose tinted glasses, the better the outcome we will get. Previous Post Crime is falling? No, no and no. Next Post Difference, and why it’s hard in the cops today. This is a good assessment of EBP, although I think there is one thing missing which casts a huge shadow over all this – namely, what do we mean by ‘it works’? We can, to a certain degree (given the difficulties of carrying out tests in the real life environment) design experiments that can show if you do tactic A, then effect B happens. That shows that ‘A’ is effective at achieving ‘B’. That’s great, and knowing that is a huge advantage. But we then come to a discussion about whether ‘B’ is a ‘good’ effect. Some of this is about wider considerations, some about longer-term impact, much is about what is the role of police. For example, body worn video seems to be effective at securing convictions and reducing complaints. But there are broader considerations about cost (and what stops being done in order to fund BWV), the impact on prosecutions where BWV is not available, and then a longer-term consideration of the impact on police relations with the public. If the definition of ‘effectiveness’ is defined tightly around convictions and complaints where BWV is used vs where it isn’t, then it is a straightforward comparison of two different methods. If ‘effectiveness’ is expanded to consider overall conviction and complaint rates, then the overall impact of BWV may not be so clear. If effectiveness is expanded further to consider public confidence, then there will be a lot of other factors to consider alongside BWV. This issue of understanding and defining ‘effectiveness’ lies behind your 3 points. No.1: Identifying a problem to which you want evidence of effective responses, requires you to first recognise there is a problem with your current effectiveness. How you define that problem depends on how you define ‘effectiveness’. No.2: there are plenty of areas where it’s clear that A is a better method all round than B, but yet many persist with B. Some of this may be due to ignorance, but mostly it’s because of different views about the effect that is really wanted. No.3: understand ‘why it works’ is key. That ‘why’ comes back to fundamental assumptions about how to manage and lead people, and consequently of what an ‘effective’ manager and leader is. EBP is much a much better approach than ‘because I know best’. But we also have to develop that EBP approach for matters such as management and leadership, how things work, and the policing role and purpose. 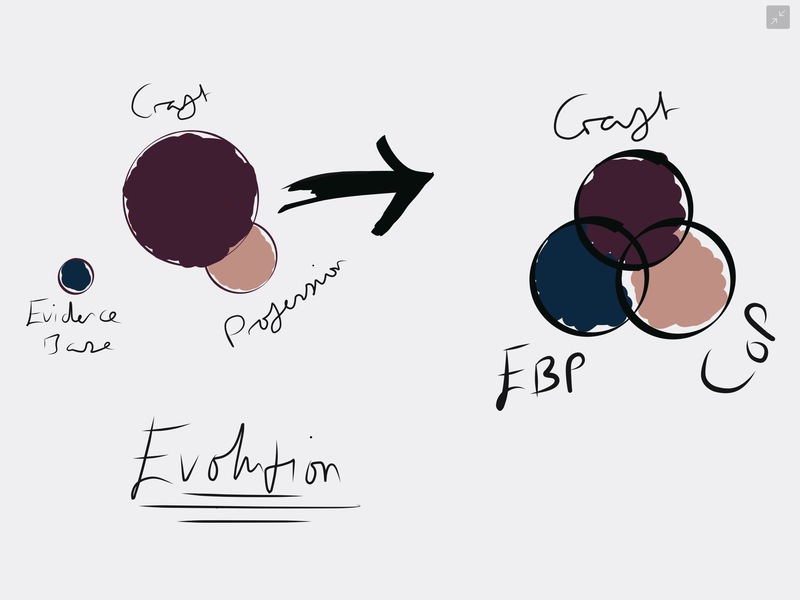 Otherwise EBP will not evolve to that venn diagram relationship.